In late spring 2017, hundreds of wealthy, millennial influencers boarded flights to the Bahamas for what was supposed to be the next up and coming music festival. Promised private villas, VIP meet and greets, five start cuisine, and breath-taking sunsets on the beach, travelers paid tens of thousands of dollars for tickets to Fyre Festival, a Coachella style party/concert featuring international music headliners and an impressive celebrity guest list. 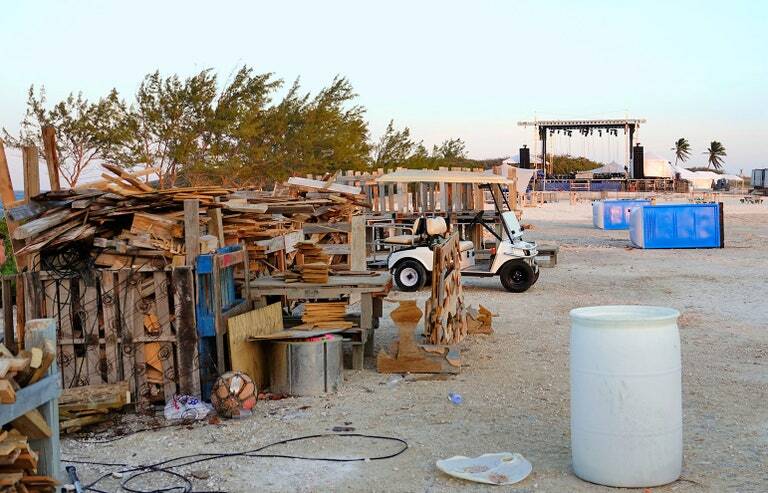 There was just one problem, festival goers arrived in the Bahamas to find a ramshackle tent city strewn across a seeming parking lot without electricity, adequate bathroom facilities, and food and water. There were no bands and no celebrities, and as the truth dawned on the festival goers that they’d been duped, the entire fiasco played itself out in real-time over social media platforms and Youtube. The Fyre Festival debacle attracted a lot of attention at the time, with much of the commentary focusing on the impact social media played in even allowing an “event” like Fyre Fest to build momentum. Comedians roasted festival attenders, calling it a massive dose of Schadenfreude. Who was really going to feel bad for rich, entitled, twenty-somethings that made their fortune promoting products on social media and, in the process of staying ahead of the curve and finding the next big thing, got complete taken? All it took was the original promo video going viral, and Fyre Festival…an event that didn’t even exist…was the hottest ticket among the influencer elite. After all wouldn’t you fork over $10,000 based on this minute and a half of footage and the fact that Kylie Jenner liked it? The fiasco has stretched on the past two years through numerous law suits and side scams, but has otherwise largely fallen out of the public eye save the casual pop culture reference or meme. Then, in a strange moment of streaming service overlap, both Netflix and Hulu released documentaries within days of each other this January that chronicled the rise of Billy McFarland, the festival creator, from entrepreneurial wunderkind to big time scam artist, and the ultimate demise of the Fyre Festival. With time to burn, (all Fyre puns intended) I set out to stream both to figure out which was worth your time (spoiler alert: both! ), and why we needed two movies in the first place (spoiler alert: both studios wanted to make money!). If you’re a documentary lover, you like true crime, or you’re oddly fascinated by the hive mind and the impact of social media on the psyche, here’s everything you want to know about these flicks, and which to watch first! 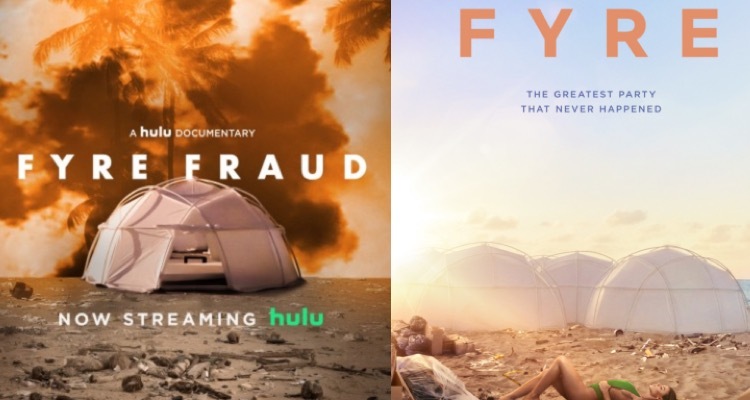 Hulu’s offering is titled Fyre Fraud, and it’s by far the sleaker of the two offerings. There are montage shots, and interviews with subjects that look wistfully off camera. They have clips from movies and TV shows built-in and a custom score. It feels like the kind of documentary that might get a small theatrical release, and you’ll definitely be reaching for the popcorn as you watch the testimonials of not only the people who helped build the festival, eventually realizing they were building an impossibility that would become a scam, but also Billy McFarland himself. And for that, Hulu faces some criticism. Here’s a guy that reportedly scammed festival goers, employees, investors, artists, and local Bahamian workers and contractors out of tens of millions of dollars. Here’s a guy who is serving six years in prison for fraudulent wire transfers. And here’s the guy that Hulu paid an undisclosed amount of money to for his interview and personal footage from meetings and events. It’s not a great optic, especially given that you definitely walk away from the film feeling like McFarland is a sociopathic bad guy. You won’t want to see, or think about, him making a hefty pay-day for the film. Netflix’s version is called FYRE: The Greatest Party that Never Happened and it has a slightly more campy, boots on the ground, grass-roots journalism feel. It digs much deeper into the making of the festival idea, interviewing a dozen people who were involved in the build up, each revealing the point they knew the event was impossible and the numerous ways their objections and concerns went ignored. There’s also a heavy dose of attention paid to the way the local Bahamian community was affected. In fact, the film drummed up so much sympathy for one interviewee that a restaurant owner who revealed in the film that she had paid out $50,000 of her own money in wages to people who came to work to build the festival was recently the recipient of a gofundme campaign that restored her savings. There’s no interview with McFarland, so Netflix gives little opportunity for redemption in his story. However, if there is a point of criticism or scandal to be had over the film, it’s that it is sponsored, in part, by Jerry Media, the media company hired by McFarland to promote Fyre. The media company contends they had nothing to do with concocting the actual scam, as they were asked to sell something they believed existed…and Netflix certainly isn’t going to contradict that story after they helped produce the film. As I spoiled above, I believe you should watch both films as they are different enough in their story telling styles that together they form a really complete picture of every facet of what went wrong. I watched the Hulu documentary first, and I think I’m glad I did because it gave a bit more complete picture of McFarland’s back story and how he even got to the point where Fyre Festival was even a possibility. The Hulu film also makes it seem a bit like everything just spiraled so quickly out of control that there was no way to fix it, instead making everyone involved part of the scam as it ballooned. Netflix is a bit more forgiving to those in wings, many of whom seem to become victims themselves as Fyre goes off the rails. Netflix also has a more undercover reporting fell to it, while Hulu aims for broad themes and commentary on the millennial generation as a whole and the impact of social media on today’s minds. At the end of the day, choosing one over the other comes down wholly to a style preference. Do you want sleek film making, or do you want to feel like you got an insider’s scope? Do you care that Hulu paid the bad guy for his testimony? Do you mind that a media company involved with the festival helped produce the Netflix film? If in doubt, flip a coin as they’re both excellent offerings with an entertaining, and completely mind-blowing, story to tell.